For several years Rose Hill has been a part of a very good work called Partners 4 Africa. This ministry is dedicated to improving lives and spreading the gospel to people in Swaziland, Zimbabwe, and South Africa. Every year we send about 400 banana boxes filled with clothes and textbooks. We financially support the feeding of hundreds of families and orphans every week. Our donations are also used to dig wells in areas where clean drinking water is greatly needed. And people who are hungry for the gospel are being spiritually fed and being brought to Christ. Twelve members travelled to Swaziland in the summer of 2013, and ten members went on a mission trip to Zimbabwe in 2015. Click here to learn more. Rose Hill members regularly donate money and food items to Brown Bag, a nonprofit agency which provides groceries to low-income elderly individuals in Columbus, Georgia and Phenix City, Alabama. The need for this kind of assistance is present and growing as more and more people of retiring age find themselves in poor and devastating situations. Recipients are able to select the items they receive at no cost to them. Through donations from Rose Hill and others, Brown Bag currently feeds about 500 people very month. Lads to Leaders/Leaderettes is the oldest and largest leadership training program used by the churches of Christ today. It started in 1968 with just 8 boys. Since then over a quarter of a million people have participated. Today there are conventions in several locations across the country with 20,000 participants every year. The goal and purpose is to help young people and adults to learn what the Bible teaches, to grow and mature spiritually, and to develop into effective Christian leaders. Through events like Know the Books, Read the Word, Good Samaritan, Bible Bowl, and many others, participating in L2L brings our whole congregation together and blesses us all. We believe strongly in being a good neighbor to our neighbors. A large area of our property is devoted to the creation of a community garden to be used by both our church family and our neighbors. We host activities such as Family Vacation Bible School and Trunk R Treat that benefit families in our congregation and in our community. Our youth group engages in a variety of service projects intended to help the elderly and handicapped. 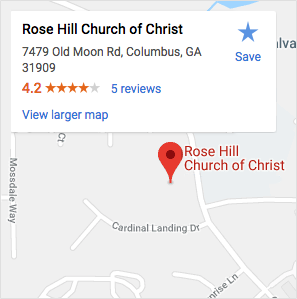 Rose Hill is a giving congregation. And not just what our members put in the collection plate, but we believe strongly in giving to help others. Every year we budget thousands of dollars to help people in our community who are struggling with financial challenges, and pretty much every year we go well over budget. We live in a time where so many are hurting, and while we can’t help as many folks as we’d like to, we do try very hard to be like Jesus in helping those in need.